Other related websites include SignalSteps.com (Lance Hunter), TensionTrader.com (Lance Hunter), FunnelTrader.com (Lance Hunter). The Quick Scalp Trader is a forex expert advisor by LeapFX.com. The Quick Scalp Trader automated forex trading software for the MetaTrader platform is a Scalper, has been forward tested on a live account by ForexPeaceArmy. 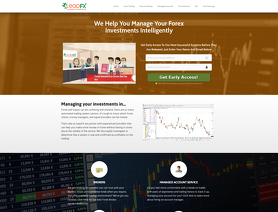 The Quick Scalp Trader forex robot trade best on EUR/USD and GBP/USD. Useless. It has been trading my money for a few months now and has 'succeeded' only in losing around a third of capital invested. Quite frankly, I could have done better by throwing darts at a chart and placing trades on where they land!